What is ACL and what do we do? The Advanced Coatings Lab (ACL) is a part of the University of California Observatories (UCO). It was developed in response to a need for improved optical coatings for ground-based astronomy, in particular, silver-based reflective coatings for telescope mirrors and broad-band anti-reflection (AR) coatings for lenses, windows and prisms. Optical coatings are thin films applied to mirror and lens surfaces to enhance reflection (for mirrors) or suppress reflection (“anti-reflection” for lenses and other transmissive optics). They can consist of one or multiple layers of various materials, and are generally quite thin, perhaps 200-400 nm in thickness for visible-light coatings – this is roughly one half a wavelength of visible light, or1/300 the diameter of a human hair. Note that the terms “thin films” and “coatings” are used interchangeably, although a coating can include multiple thin films. Astronomy is an observational – rather than experimental – science. Except for within the solar system (the realm of planetary science), we cannot visit and manipulate the objects we study – we can only observe and analyze the light we receive from these objects. Most of this light is very faint (it’s dark at night!) and so our observations are limited by how quickly we can gather enough light for our analysis. Bigger telescopes mean more light collected more quickly, and has driven the increase in telescope size over the last few centuries. However, telescopes and the instruments that gather the light are not 100% efficient and light is lost at every surface it strikes. For example, vacuum-deposited aluminum has been the standard telescope coating since the 1930s. It is both highly reflective and when exposed to air it forms a transparent oxide layer that protects it against further chemical change. However, these aluminum coatings absorb about 10% of the light that falls on them. In most modern large telescopes, there are 3 mirrors, so roughly 30% of the light is lost. Similarly, the instruments used to analyze the light typically will contain 1 or more mirrors, and 8-10 lenses. An uncoated glass surface reflects approximately 4% of the light that hits it; anti-reflections coatings typically drop this to 1% per surface. Nevertheless, with ~18 lens surfaces, this is still an 18% loss. In fact, most telescope-plus-instrument combinations lose about 50% of the total light that reaches them. Improved coatings with even modest gains can reduce these losses significantly when applied to the large number of optical surfaces involved. Silver is more reflective than aluminum over most wavelengths (except for the deep UV). However, silver does not form a protective oxide, and it is prone to tarnishing and corrosion. Therefore, to use silver, we must over-coat it with protective layers of transparent materials that prevent reactants such as sulfur, chlorine and water from reaching it. Developing silver-based coatings has been a major goal of the Advanced Coating Lab since its inception. Silica sol-gel is a porous material with a refractive index ideal for AR coatings on most glass, preventing almost all loss at a particular wavelength. 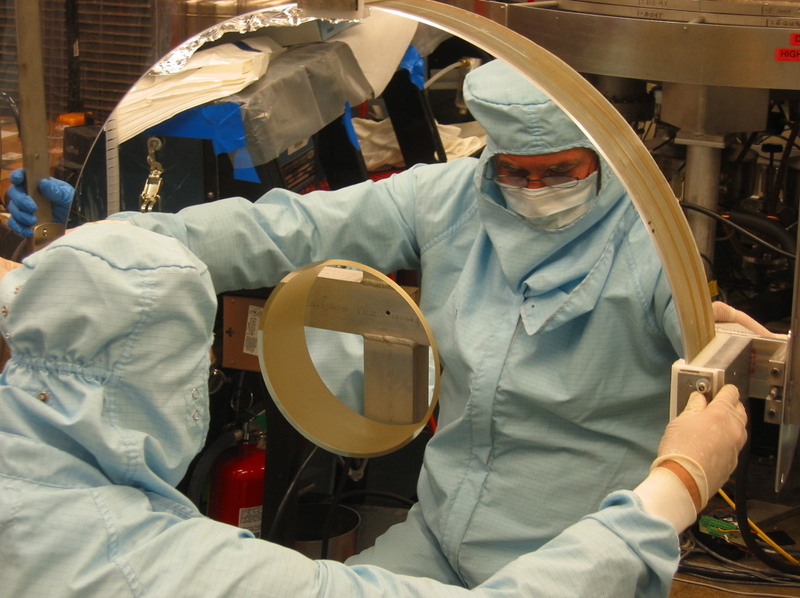 It was developed as an anti-reflection coating at Lawrence Livermore National Labs (LLNL) where they are using powerful lasers – so sol-gel coatings tuned to the proper wavelength would prevent laser light from being absorbed and (over-)heating the lenses and windows through which the laser light passed. At ACL, our work has been to broaden the “pass-band” (the range of wavelengths) over which sol-gel based coatings would be effective. The simple explanation: the coating material is heated to evaporation on either a bulk scale (resistive heating), locally (e-beam) or atomic scale (sputtering). The evaporated material that falls on the mirror or lens builds up the coating. For optics, almost all coatings are deposited using Physical Vapor Deposition, or PVD. In these processes, a material is evaporated or sputtered in a vacuum, crosses some distance, and lands on the substrate. Materials may be heated by being in contact with a hot resistive metal through which a large current is passed; examples are hot filaments (traditionally used for aluminum deposition), or “boats” or crucibles wrapped with heater wires. Generally, only materials with relatively low evaporation temperatures can be deposited this way. More refractory materials need to be heated by a beam of energetic electrons in an electron gun (“e-gun”). Such depositions may be modified by striking the growing film with energetic ions from a ion source; this is call Ion Assisted Deposition, or IAD. Alternatively, materials can be sputtered by very energetic ions generated by a magnetron (“magnetron sputtering”) or a directed ion source (“ion beam sputtering,” or IBS). The vacuums appropriate for PVD are so good that most evaporated atoms travel from the source to the substrate without collision with any residual gas. (Another way to say this is that the source-to-substrate distance is less than 1 “mean free path.”) This means that the deposition is “line of sight,” and due to a process called “self-shadowing” very thick films will become rough and porous, and “pinholes” can be created in films of any thickness. IAD helps by adding energy to the growing film, allowing the atoms/molecules to move around on the surface and pack more densely. Residual gas pressure is usually low enough to prevent a lot of gas from becoming entrapped in the film. Film thickness varies with the distance from source to substrate, and with the angle of the substrate relative to the incoming stream, so maintaining thickness uniformity with PVD is a challenge that must be faced. The desired film material can be directly evaporated or sputtered: for example, pure metal films of Aluminum or Silver are always deposited this way, as are some compounds like magnesium fluoride. Metal oxides (like aluminum oxide, Al2O3) can also be deposited starting from the oxide material, but a preferable method is to deposit them “reactively” – we evaporate the metal in the presence of a small amount of oxygen, and the metal and oxygen chemically combine at the surface. Usually, the oxygen is supplied as a plasma generated by an ion source or magnetron, although some metals with a strong affinity for oxygen (such as aluminum or yttrium) will oxidize well in a neutral gas. Similarly, nitrides are almost always deposited using reactive deposition in a nitrogen plasma. Chemical Vapor Deposition (CVD) is another way to deposit coatings, although they are rarely used for optics. In this case (always “reactive”), chemical reagents are introduced as vapor into a vacuum, usually at high temperature, and the desired material condenses on the substrate. CVD can deposit thick coatings quickly, and conformally – that is, the thickness is the same everywhere, independent of substrate shape. CVD is used for coating many items for wear resistance or decoration. However, the films tend to contain more trapped contaminants than to PVD films. A newer variant of CVD called Atomic Layer Deposition (ALD) introduces carefully-chosen reagents sequentially to form mono-layers on the substrate; this process seems to have the best properties of PVD and CVD, and shows promise for optical coatings. It is inherently slow, however, since the films can only be grown at a few molecular layers per minute, so thick films are impractical with this process. Coming soon: performance, uniformity, durability.